An Excel blog for engineers and scientists, and an engineering and science blog for Excel users. A recent paper by Alexander Klotz of McGill University, Montreal, has stirred a bit of interest in the pop-science press. The paper looks at the old question of the time taken to fall through a hole passing through the centre of the Earth, and back up to the surface at the opposite point on the Earth’s surface. This calculation makes the usual assumptions of a perfect vacuum, and zero friction, but instead of the usual simplification of assuming the Earth to be of constant density, it allows for the actual estimated varying density along the length of the hole, and finds that the transit time would be reduced from 44 minutes to just over 38 minutes. There is a good article on the paper at How long would it take you to fall through Earth?, and a rather more excitable one at How Long Would It Take To Fall Through The Center Of The Earth? I came up with a time of 38 minutes and 57 seconds, compared with 38 minutes and 11 seconds found by Klotz. Another surprising finding was that if a constant acceleration of 9.81 m/s2 is assumed all the way to the centre, then -9.81 m/s2 all the way back up to the surface, the transit time is only reduced to 38 minutes. 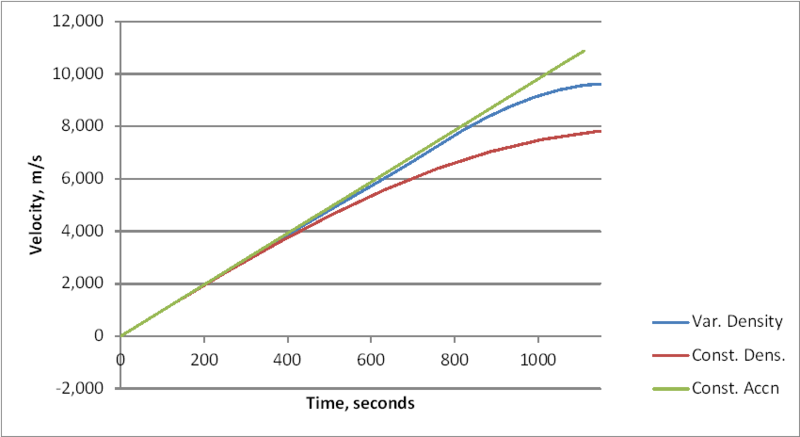 The graph below shows what is happening; the effect of increasing density is that the acceleration does remain close to constant over much of the journey, and it is only in the final stages that the velocity assuming constant acceleration becomes significantly faster than the velocity based on the actual (estimated) density. This entry was posted in Excel, Maths, Newton and tagged hole through the middle of the earth, ODE Function, varying density. Bookmark the permalink. Thanks Alfred (have another star). I wanted to look at the numbers actually used in the paper, but not badly enough to pay $30-40 for it! Hello, this is Alex Klotz. I’m glad to see other people are interested in this problem. Another person who studies this time of thing is mathematician Andrew Simoson, he also looked at the fall time for a piecewise description of Earth’s internal field, and has written some cool stuff factoring in the rotation. I must warn you about the arxiv version, the section on brachistochrones has a theoretical error so those results based on the internal profile (particularly the mustache-looking paths) shouldn’t be trusted. It was corrected in the published version. Hello Alex, I’m glad you found this post, and thanks for the warning on the brachistochrones. I’ll have a look at that when I have some time. I also had a look at the path for a hole across the equator, including the effect of rotation. I’ll add a link to that. Another related post was looking at Euler’s formula for buckling of columns, so I’ll add a link for that one. I’ll go and look up Andrew Simoson now.